This monarch had seen the advantage of a copper coinage in Scotland, and the beneficial result of the royal issue in Ireland of copper coins bearing date 1601 and 1602. A pattern, presumably for a copper piece, was struck early in his reign. 1. O. I. R. crowned. To the left an expanded rose between two pellets, to the right a thistle with pellets as before. Below the initials is a small rose between two pellets. R. A portcullis crowned. R. 6. R. A crowned harp. FRA. ET. HIB. REX. Common. As will appear from the preceding illustrations, the shape of the harp also differs on various Coins; some have the bird's head in profile, others, the full face, and others have no bird's head at all. There are variations in the sizes of these coins. In my own cabinet, and in that of Mr. J. B. Caldecott, are examples of a somewhat oblong shape on which the harp has a bird's head and the m. m. on both sides is a small cross. The legend IACO. D. G. MAG. BRI commences to the left at the bottom of the coin, and a pellet occurs between the ends of the sceptres. The reverse legend is FRA. ET. HIB. REX. ; of this piece there is an imperfect representation in Simon, Pl. 6, No. 128, but Snelling (Copper Coinage, p. 8) considered this an error, as he had never seen one. A small piece half the size of the ordinary token was considered by Snelling to have been a half-farthing, but was more probably the result of an attempt still further to impose upon the public. Its rarity affords some evidence that such attempt was successful but for a very short period. This coin weighs four grains or thereabouts. This seems almost to justify Snelling's conjecture, as although the patentees were entitled to coin farthings of the weight of 6 grains, the larger pieces, when well-preserved, weigh from 8 to 8½ grains, and although no half-farthings were authorized they were certainly mentioned in one of the previous applications to the King on the subject of the coinage. This token is generally found silvered, and between the sceptres and immediately under the crown will be found on some of them a minute capital letter. Of these A B C D E F O and Z have been observed. The Z(?) may be the figure 2, in which case the O is also a figure, and one may expect to find the figure 1 on an example, as these three mint marks occur on the gold and silver coinage of Elizabeth, and the figure 1 occurs on as a mint mark on a farthing (Type 1) of Charles I. The only mint mark is a fret, which occurs on the reverse only. The fret clouée as this is, was a charge on the Harrington Arms, and is in heraldry sometimes called the Harrington Knot. 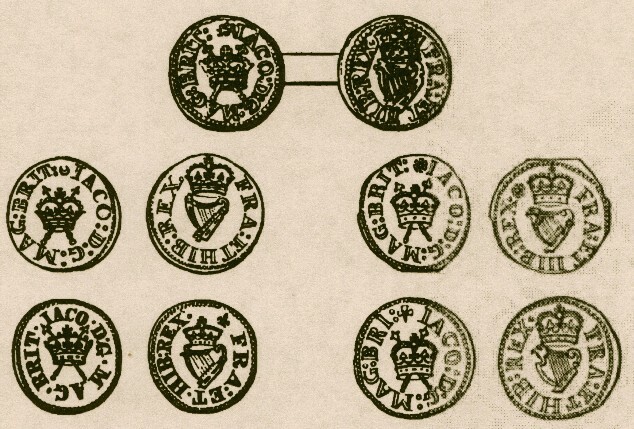 There are some pieces of a size intermediate between that of the the ordinary tokens and that of the farthings last mentioned, and they resemble these last in the fact that the mint marks, of which the saltire cross, cinquefoil, lis (large and small) and trefoil only have hitherto been observed by me, occur on the reverse only. One of slightly larger module and with a slight difference in the position of the word IACO bears the m. m. bell. The m. m. fret never occurs on these or the larger pieces. It may be further noted that the harp on the larger coins has five or six strings, but that on the intermediate and small pieces, has seven or eight. Notwithstanding the order in which I have placed these tokens, and the observations I have made in connection with them, I am bound to admit that, but for the question of weight, it would be more reasonable to suppose that the smallest pieces were coined first, those of the intermediate size next, and the large pieces last, and in support of this contention could be urged the fact that it is more probable that those with the Harrington fret should have been the first issue, particularly as the last holder of the patent was not a Harrington at all; and secondly, and perhaps with equal force, it might be argued that as the larger pieces are almost identical in size and workmanship with the earliest tokens issued by Charles I., it is much more probable that they formed part of the latest issue of his predecessor. The deficiency in weight of the smaller pieces would in that event be fairly supposed to have been the result of a first attempt at imposition, which was gradually remedied, until an issue of the full weight authorized was secured. The coins themselves were exceedingly unpopular. They were poor in workmanship, and inconvenient on account of their small size and extreme thinness. Counterfeits swarmed, and it needed numerous proclamations to obtain for them even a limited currency. The literature of the time is full of disparaging allusions to them, and they were at last hawked through the Kingdom by parcels of £20. each, to the mayors of cities and boroughs, who were commanded to put them into circulation at a discount, and to remit the money realized to the before named Gerard Malynes. During this and the following reign, slips of copper occur with more than one token stamped thereon by way of trial. As many as four on one slip have occurred, and from this it may be inferred that the tokens were struck in the first instance on sheet copper, and were subsequently cut out.